Hale Woodruff was a significant American artist and an influential educator of the mid-twentieth century. In his murals, paintings, and prints, he explored black history and experience from slavery through his own time. As a professor at both Atlanta University and New York University, he had a major impact in advancing the work of fellow African American artists. Woodruff grew up in Nashville, Tennessee, and went on to study art at Harvard University and the School of the Art Institute of Chicago. He spent four years in Paris, where he embraced European modernist styles, such as Cubism. Woodruff developed a distinctive American regionalist style in Atlanta in the 1930s and ’40s where he turned his attention to African American history and life. He understood art as an agent for social change and was inspired by the politically charged work of Mexican muralist Diego Rivera. (See the Portland Art Museum poster of Rivera’s The Fruits of Labor.) Woodruff spent the summer of 1938 studying with and working alongside Rivera in Mexico. When Woodruff returned to the United States, he created some of his most widely acclaimed works: bold, brightly colored murals portraying the 1849 mutiny of African slaves aboard the slave ship Amistad and their subsequent trial and acquittal. Woodruff played an important role in promoting the work of other African American artists as well. In 1942, while still at Atlanta University, Woodruff founded what was known as the Exhibition for African American artists. It was one of the only national venues in the United States where artists of color could exhibit their works without segregation. In New York in 1962, Woodruff and Romare Bearden cofounded Spiral, a group of African American artists who joined together to explore their common cultural experiences as black artists. 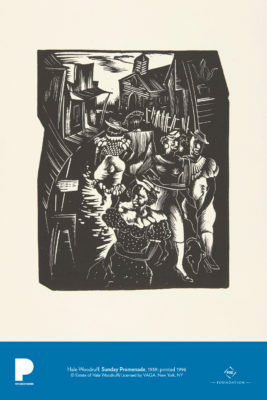 Sunday Promenade, the linocut print reproduced here, is one in a powerful series portraying the everyday experiences of African Americans in Atlanta during the Great Depression. Woodruff explored the pervasive violence of lynching and the mundane suffering of poverty through some works in the series. Here, he conveys liveliness and beauty in the procession of women dressed in their Sunday best. Linocut is a relief print produced in a manner similar to a woodcut but that uses linoleum as the surface into which the design is cut. The soft linoleum can be cut away easily to produce a raised surface that can be inked and printed. The linoleum block consists of a thin layer of linoleum (a canvas backing coated with a preparation of solidified linseed oil) usually mounted on wood. In high school in Nashville, Tennessee, Hale Woodruff was the cartoonist for his school’s newspaper. Browse through your own school’s paper, or the local newspaper, and reflect on the style and subject matter of the cartoons. What issues do they address? Woodruff created Sunday Promenade when he lived in Atlanta. In what ways does this work record the world around him? Describe the setting and people. How do you feel as you look at it? How would you characterize the mood or tone of this work? Look closely at Woodruff’s Sunday Promenade. Describe the work’s composition, or arrangement of elements. What lines and shapes do you notice? How does Woodruff create a sense of movement and life? Hale Woodruff stated: “I wanted to do more than teach art; I wanted to bring art to the community as a whole.” How was he able to achieve this through his artistic practice and his involvement in the community as an educator and an artist? Compare and contrast Rivera’s lithograph The Fruits of Labor, featured in this Poster Project series, with Woodruff’s linocut. What effect do the different printmaking methods have on the works? What do you notice about the subject matter and the composition of each print? How are they alike? How are they different? Hale Woodruff and Diego Rivera were both celebrated muralists who chose to create prints as well. The differences between the two forms are readily apparent: The murals are monumental in scale, brightly colored, unique works, often displayed in the open for the public. The prints are much smaller, black-and-white, and reproducible in mass production. What attracted both of these artists to both media? How did both printmaking and mural painting further each artist’s goal of promoting social change through art?